The United States and the European Union are two of the largest economic entities in the world. The U.S. dollar is the world's most heavily traded and most widely held currency and was on one side of 87.6% of all trades as of April 2016. The currency of the European Union, known as the euro, is the world's second most popular currency. In 2016, the Euro was on one side of 31.3% of the trades. Naturally, because EUR/USD is made up of the two most popular currencies in the world, it is the most actively traded currency pair in the forex market. The U.S. dollar plays a unique role in the world of international finance. As the world's reserve currency, the U.S. dollar is used to settle most international transactions. When global central banks hold foreign currency reserves, a large portion of those reserves is often held in U.S. dollars. In addition, many smaller countries choose either to peg their currency's value to that of the U.S. dollar or forgo having their own currency, choosing to use the U.S. dollar instead. The price of gold (and other commodities) is generally set in U.S. dollars, too. Not only this, but the Organization of Petroleum Exporting Countries (OPEC) transacts in U.S. dollars. This means that when a nation buys or sells oil, it buys or sells the U.S. dollar at the same time. All of these factors contribute to the dollar's status as the world's most important currency. The primary factor that influences the direction of the EUR/USD pair is the relative strength of the two economies. With all other things being equal, a faster-growing U.S. economy strengthens the dollar against the euro, and a faster-growing European Union economy strengthens the euro against the dollar. One key sign of the relative strength of the two economies is the level of interest rates. When U.S. interest rates are higher than those of key European economies, the dollar generally strengthens. When eurozone interest rates are higher, the dollar usually weakens. Because the EUR/USD is such a popular currency pair, arbitrage opportunities are not often available. However, investors still enjoy trading the pair. As the world's most liquid currency pair, the EUR/USD offers very low bid-ask spreads and constant liquidity for traders wanting to buy or sell. These two features are important to speculators and help contribute to the pair's popularity. Furthermore, the large number of market participants and the availability of economic and financial data allow traders to constantly formulate and reassess their positions and opinions. This constant activity provides for relatively high levels of volatility, which can lead to opportunities for profit. What Makes the EUR/USD A Risky Trade Now? What are the current risks of trading the EUR/USD pair? The Fed may raise interest rates this summer and the ECB has begun a quanitative easing program. 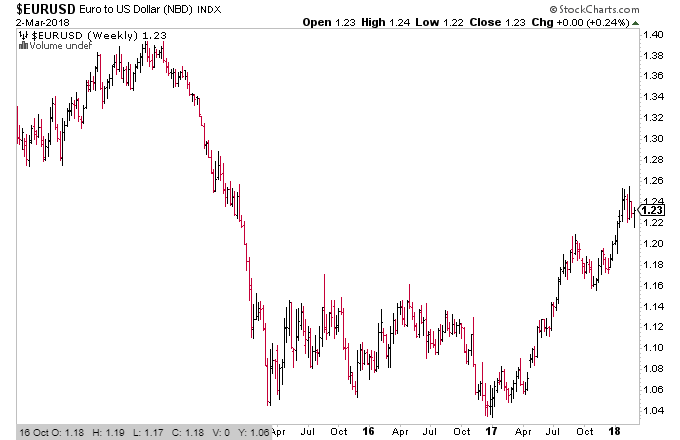 Will The US Dollar Surpass The Euro? The euro is weakening as the European Union turns to quantitative easing to help its economic woes. Meanwhile, the U.S. dollar is strengthening. Learn about the potential risks and rewards of long term investing in the euro and the current status of the European Union's financial markets. Learn about the most traded currencies and the strategies used to trade them.